Ready to begin an extended road trip, but do not want to sleep in an impersonal and sometimes dirty hotel? Then you need to come to your local Airstream dealer in Wisconsin and see one of the many new and used Airstream trailers for sale. Ewald’s Airstream of Wisconsin. At Ewald’s we have an Airstream trailer to fit everyone's need. Whether you are looking for an easy pack up and go camper for two or a travel trailer that can fit the whole family for months on end. If you are looking for a compact go anywhere do anything trailer, look no further than the Airstream Bambi line. 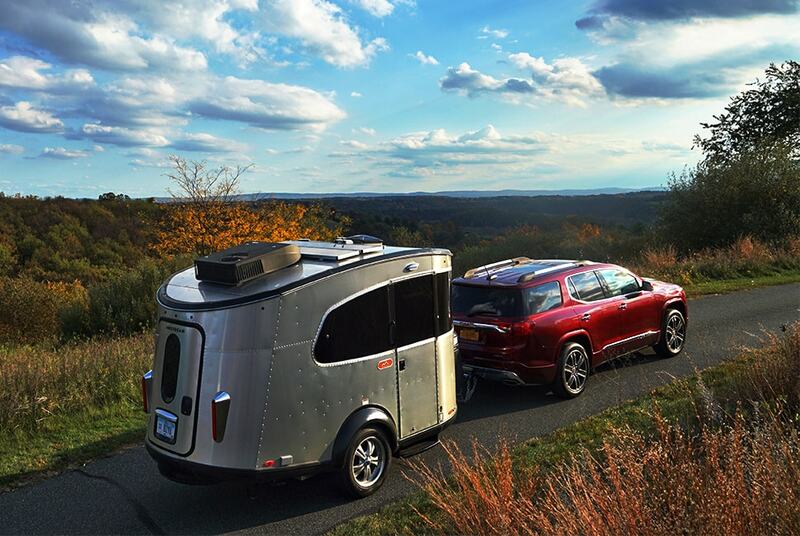 The Airstream Bambi line is single axle trailers that can be easily towed with a small SUV. One of the many Airstream Bambi trailers for sale at Ewald’s Airstream of Wisconsin is the multi-purpose Airstream Basecamp for sale. This Airstream trailer is the perfect size for a couple or single person to take on a cross-country adventure. With an exterior length of 16’3” and a net carrying capacity of 913, this Airstream travel trailer can fit in those tiny spaces that other bigger more bulky trailers would not. The Basecamp sleeps up to 2 people comfortably and comes with a full kitchen and bathroom with a 22-gallon fresh-water tank, and a 29-gallon black water tank. Do not let this Airstream trailers tiny size fool you however because with intelligent design and storage features, everything in the Basecamp has a place and there is a place for everything. 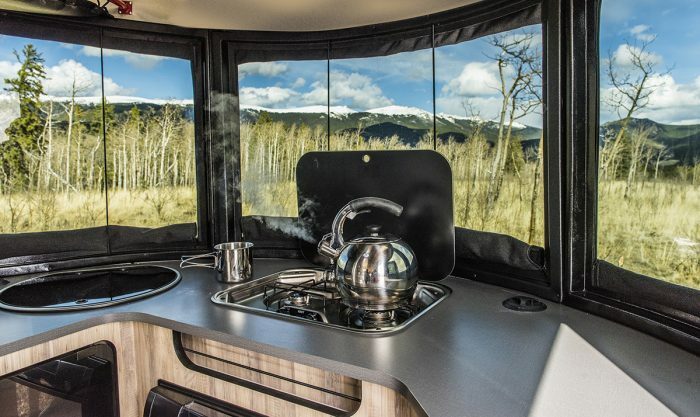 Even though this Airstream Bambi is small, the Airstream Basecamp is full of creative and innovative features to make your camping trip a breeze. The Airstream Basecamp comes with features such as a bathroom pass-through shower head; now you can easily spray off mud and dirt before packing up your Airstream trailer. The Basecamp also features a rear 26” X 46” hatch making it easier than ever to pack up your larger items such as bikes and kayaks. 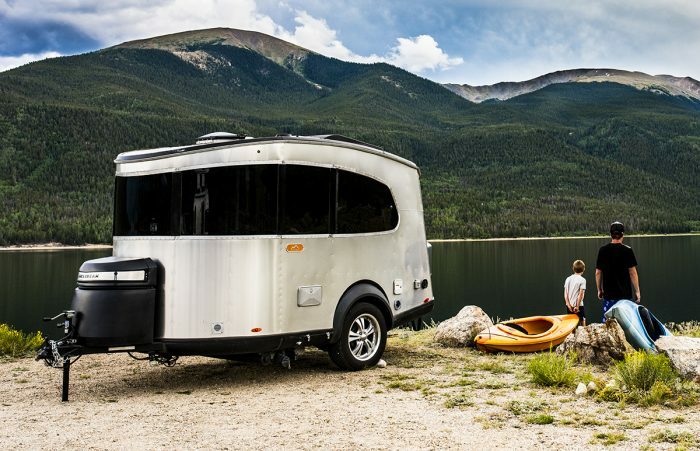 The Airstream Basecamp features a fluid design that is also aerodynamic, and with anti-sway technology makes the Airstream Basecamp easy and pain-free tow. Come to your local Airstream dealer in Wisconsin and see the Airstream Basecamp for sale and one of the many other Airstream Bambi trailers for sale in Franklin, Wisconsin. If an Airstream Bambi, like the Airstream Basecamp, is not what you are after come and see one of the many other new and used Airstream trailers for sale at Ewald’s Airstream of Wisconsin in Franklin, Wisconsin. Your local Airstream dealer, Ewald’s Airstream of Wisconsin is located at 6319 S 108th St in Franklin, Wisconsin 53132.